Submit your pet to the Pet Spotlight! Who is Countess Boo? I'll tell you who. "Why do you keep reading that darn Book, Boo?" Yoomino yawned lazily. "Aren't you interested in playing games? Or battling? Or... Anything?" Boo sat her book down, and she sighs. "I'm sorry... What were you saying?" Yoomino looked at the cover, and he smirked. "MAGAX Volume 2, Book 5? Isn't it about that Wocky you had a crush on when you were smaller?" Her face went red a bit. "WHAT?! It's not like that! I just plainly admire him! He was once a slave to the evil Hubrid nox, But then, He decided to pay for his sins! And he battled the Vile Hubrid Nox! Even though the Faeries won't forgive him, I still see him as a hero! He's just trying his bes--"
Yoomino was smirking. "You're getting so worked up over this." Yoomino chuckled. "Well, I'd suggest you train up more instead of read all the time! Maybe we'll have our chance one day! So grab your obsidian Dagger, It's time to take the fight to Punching Bag bob!" Boo sighed, and she looked to her book. "... Can I finish reading first?" The little Poogle rolled his eyes. "Okay, But then we go train, Alright?" Boo smiles happily. "Yes, Mister Yoomino, Sir!" Yoomino smiles, and he walks out. Boo smiled and she picked her book back up. 'Imagine... What would it be like to fight alongside Magax...?" She sighed, and she smiled as she kept her reading, her obsidian Dagger Gleaming on her desk. Yoomino then shook his head. "Hopefully she'll come through with that deal... We make these kind of Deals all the time... But she doesn't seem to Go through with it..."
After a while, She finally finishes, and she hurries downstairs, clutching her dagger and wooden shield. "I'm rea-- Yoomino??" she scanned the room for the little Blue Poogle, Only to see Valerio, The Yellow Poogle. "Valerio, Where's Yoomino?" Valerio yawned. "He told me to tell you that you broke your promise again. He waited all day for you. What were you even doing?" She quietly squeaked. "I was... In... The Library... Reading..."
Valerio sighed. "Boo, I wish you would stop reading those books... It's consuming all of your time." Boo nods. "I'm sorry... Maybe Tomorrow, I won't read any of my books so Yoomino can Teach me how to fight! I want so badly to fight crime!" Valerio looks to the side towards a clock. "Well, It's Midnight... So you better hurry on to Bed." Boo looked to the clock as well, Then she froze, her eyes widening, Then she ran off to bed. In the end, Boo ends up training as much as she possibly could, And she even ends up traveling to Hubrid Nox's Mansion. Of course, He wasn't there, But, Just being there made her wish she had a Mortal enemy of her own too. Of course, She had gotten her Wish, But that's a story for another Day. IMPORTANT - SUBMISSION POLICY! 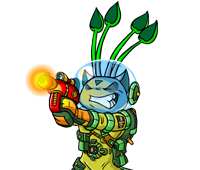 By uploading or otherwise submitting any materials to Neopets, you (and your parents) are automatically granting us permission to use those materials for free in any manner we can think of forever throughout the universe. These materials must be created ONLY by the person submitting them - you cannot submit someone else's work. Also, if you're under age 18, ALWAYS check with your parents before you submit anything to us!